People don't generally think of a dentist as the healthcare professional to see for recurring headaches or migraines; yet dentists can play a role in diagnosing and even treating your condition. That's because quite often, recurring pain that is felt in the area of the temples on the sides of the head is actually caused by unconscious habits of clenching and/or grinding the teeth. These habits, which often manifest during sleep, put tremendous pressure on the muscles that work your jaw joint, also called the temporomandibular joint (TMJ). The fan-shaped temporalis muscles located over your temples on either side of your head are two of several muscles involved in jaw movement. You can easily feel them working if you put your fingertips on your temples while clenching and unclenching your jaw. When temporalis muscles go into spasm from too much clenching, headache symptoms may result. This is not to say that headaches and migraines are always caused by TMJ problems, also known as temporomandibular disorders (TMD). But given the established link between them, it definitely bears looking into — especially if a diagnosis remains elusive in your case. The first thing you need is a thorough oral exam to determine if there is evidence of a clenching or grinding (also known as “bruxing”) habit or TMD. If so, there are things you can do for immediate and long-term relief. Sometimes eating softer foods for a few days can reduce stress on the muscles and joints. Ice and/or moist heat can help relieve soreness and inflammation. Gentle stretching exercises, non-steroidal anti-inflammatory medications such as ibuprofen, and muscle relaxants can also provide relief. Finally, a custom-made nightguard to wear when you sleep might be recommended. This plastic oral appliance, which fits over the teeth, can control or even eliminate clenching and grinding, reducing pressure on the muscles that work the jaw and the jaw joint itself. Some users have reported that their headaches or even migraines are less frequent and/or less intense. 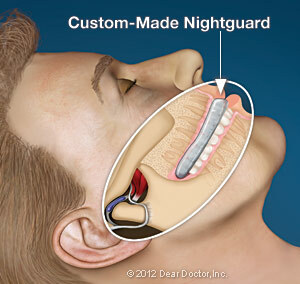 Will a nightguard or other TMD therapy relieve your headaches? It depends on the source of the problem. But living with chronic headaches or facial pain is no fun — so don't delay scheduling an exam and a consultation.